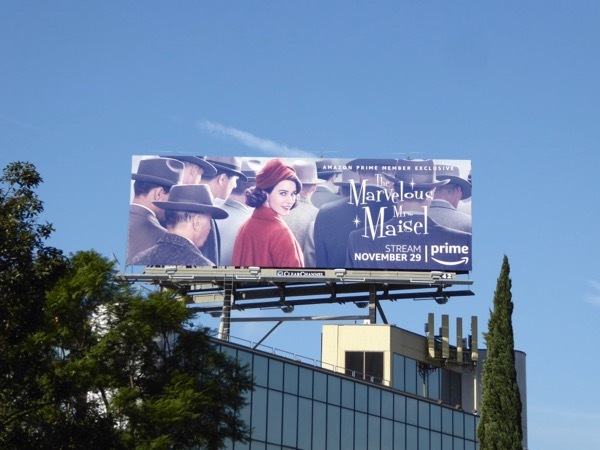 After Amazon Studios cancelled lavish period dramas The Last Tycoon and Z: The Beginning of Everything after just one season each, can comedy help The Marvelous Mrs. Maisel become a multi-season hit. 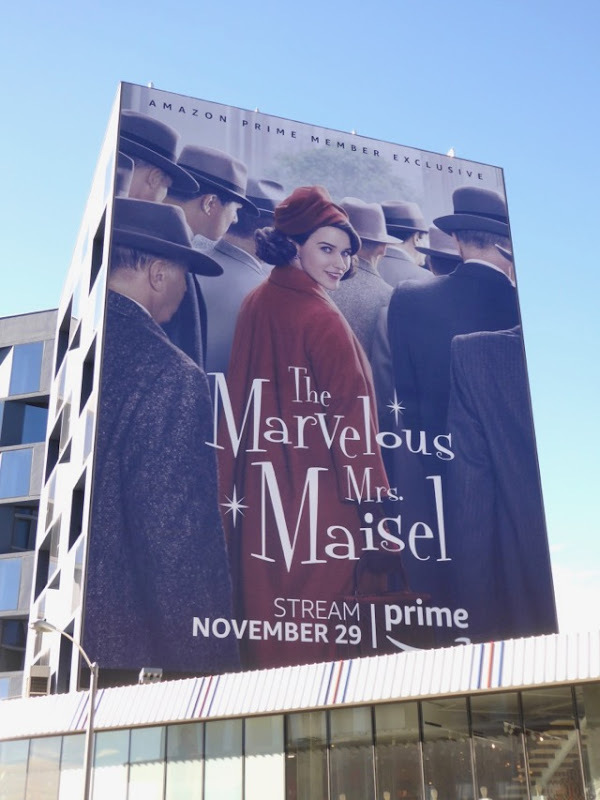 In this original series from the creator of the Gilmore Girls, House of Cards Rachel Brosnahan plays a 1950s housewife, 'Miriam "Midge" Masiel', who decides to become a stand-up comedian in Manhattan. 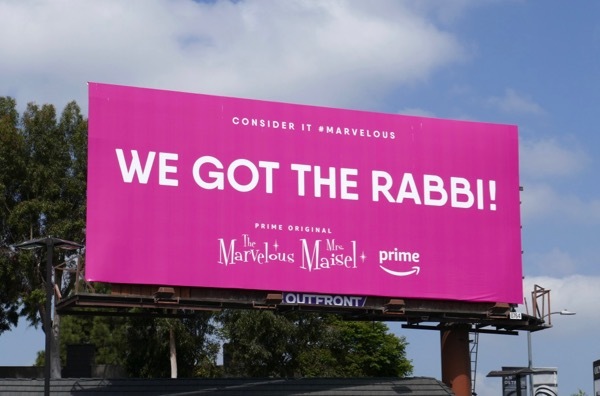 When her husband leaves her for another woman, this sunny and sharp Jewish wife and mother drunkenly takes to the comedy club stage and finds out she has a talent for stand-up. 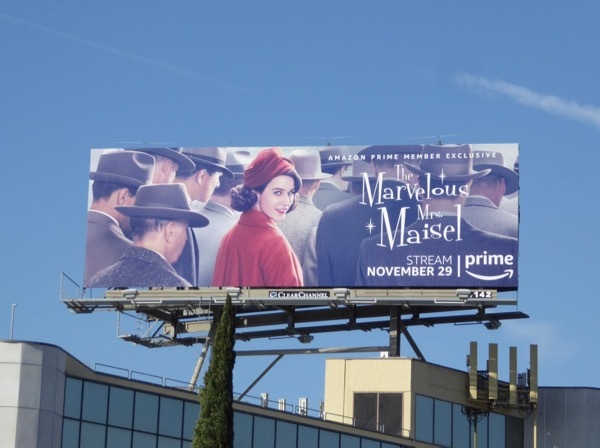 These mischievous series launch billboards were snapped above San Vicente Boulevard, Olympic Boulevard and the Sunset Strip from November 7 to November 11, 2017. 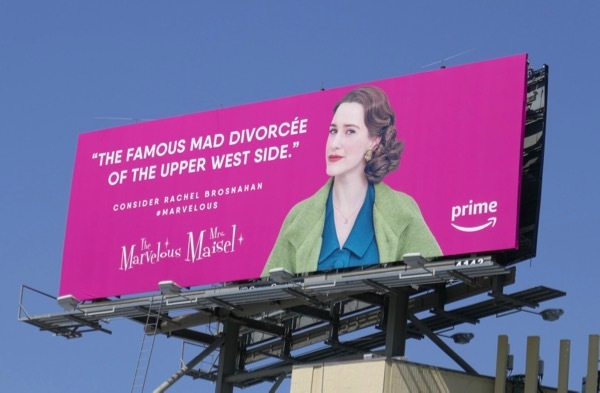 Only time will tell whether Midge is funny enough to earn herself a return gig to the stage, and the streaming service, in the future. 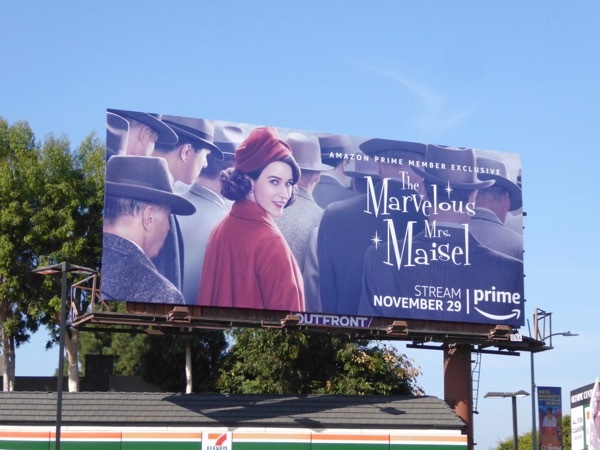 UPDATED: The Marvelous Mrs. Maisel scored two Golden Globes for Best Television Series and for Best TV Actress for Rachel Brosnahan in the Musical or Comedy category for its debut season, so can the Amazon Prime original win big again at the Emmys? 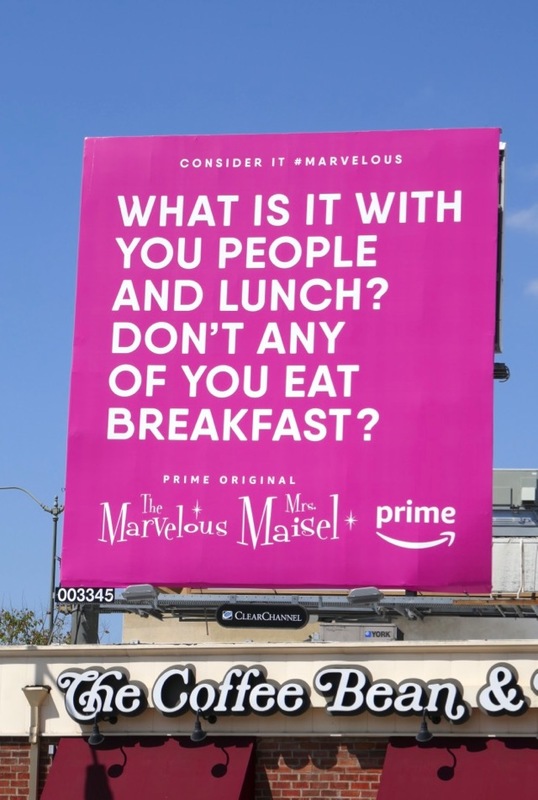 Maybe these inspired Emmy consideration campaign billboards spotted along Sunset Boulevard and along Hollywood Boulevard near the Pantages Theatre on April 10, 2018, can help. 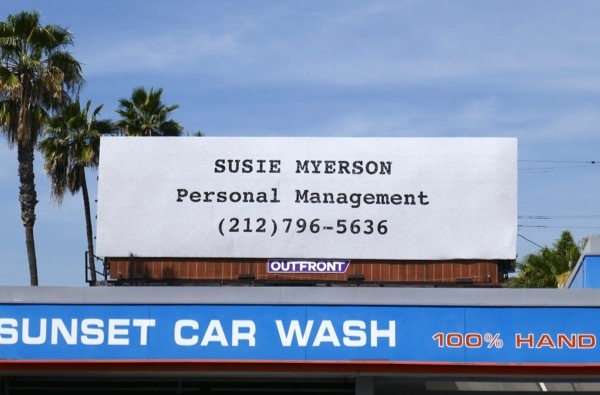 This simple ad creatives are themed as if Midge Maisel's stand-up comedy agent, Alex Borstein's 'Susie Myerson', wrote them with an intriguing hotline for enquiring minds to call. They are certainly entertaining and stand out in a town which is all about casting calls, plus the interactive telephone number is a fun touch. 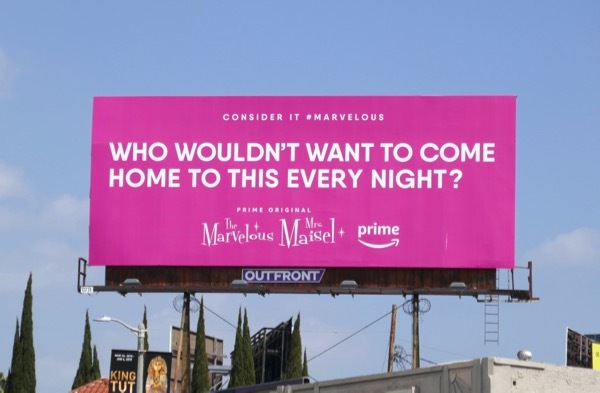 Apparently this Emmy stunt runs for four weeks and is produced for Amazon Studios by the female content creators at WhoHaHa. 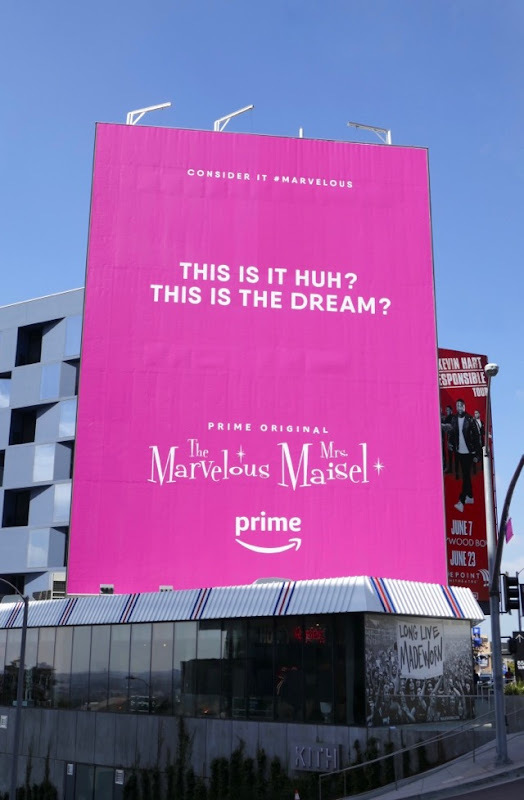 UPDATED: Following those fun interactive teaser Emmy billboards here's also the full-blown Emmy consideration campaign filling the skies of L.A. this May. 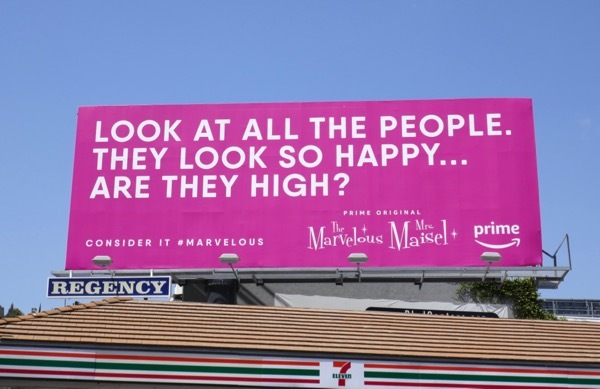 These witty quote billboards really stand out in the city skyline in that marvelous hot pink colour. 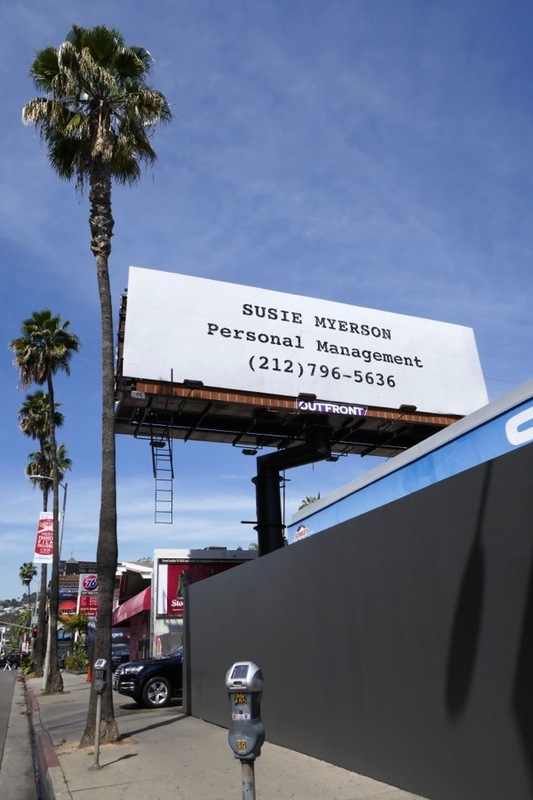 They were snapped along Highland Avenue, La Brea Avenue, San Vicente Boulevard, Olympic Boulevard and the Sunset Strip from May 10 to May 14, 2018. 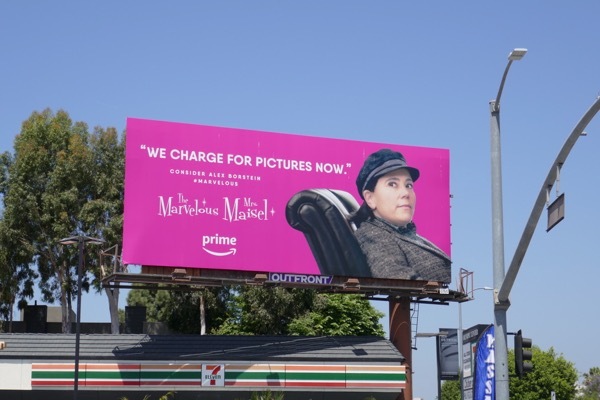 You can't really miss this vibrant Emmy campaign, but will it do the trick and score some nominations for this freshman Amazon comedy? 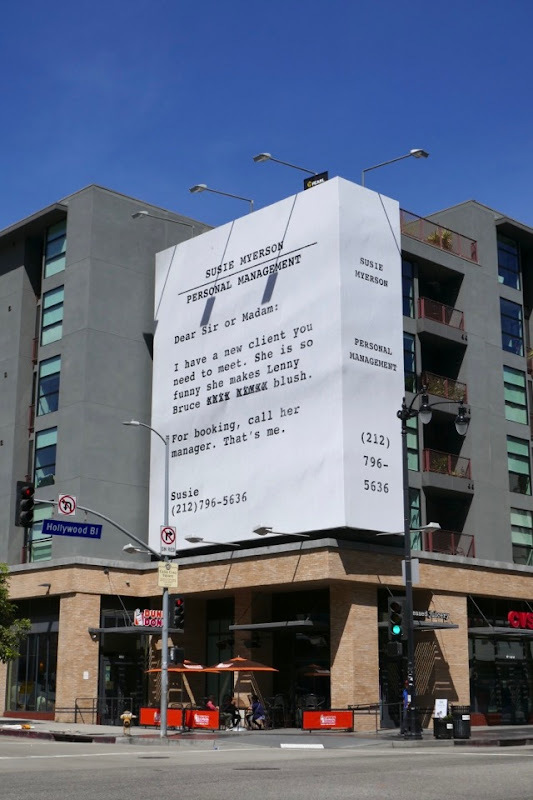 UPDATED: Plus here's another fun, squarer format ad creative spotted along Santa Monica boulevard at Beverly Glen Boulevard on May 17, 2018. 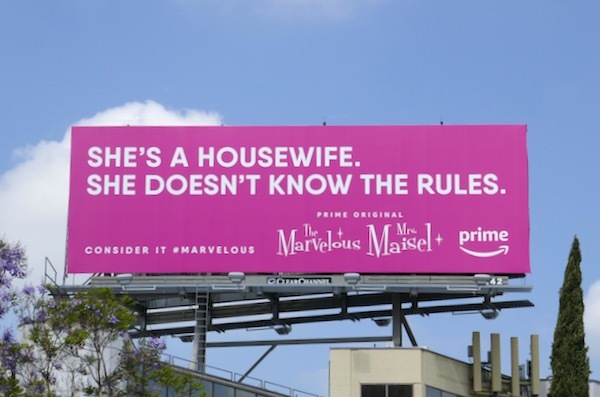 UPDATED: Just when you thought you'd seen the full Emmy campaign along come more witty hot pink billboards shining a spotlight on the actresses in the TV show. 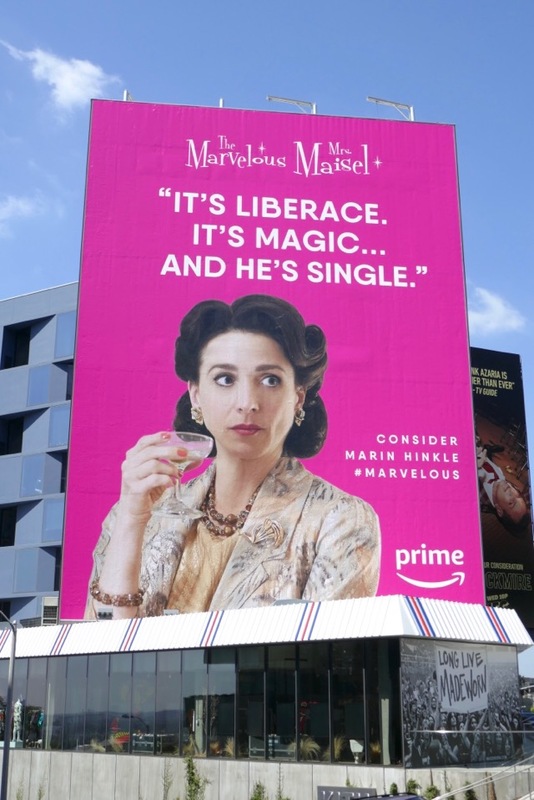 One of Daily Billboard's favourites is this Liberace-themed ad creative, super-sized along the Sunset Strip to support Marin Hinkle as Midge's mother. 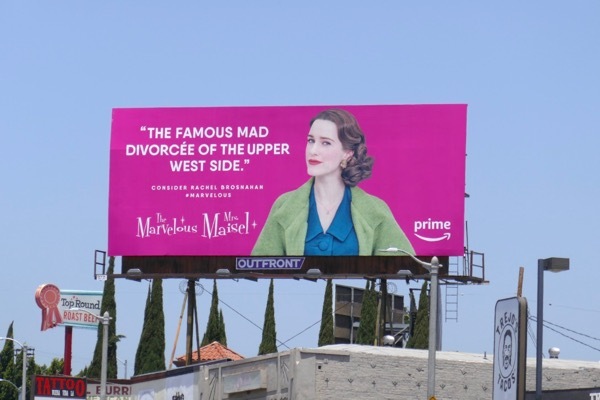 Obviously the star of the show, Rachel Brosnahan, gets her own solo billboard as the 'famous mad divorcee' too along La Brea Avenue and above San Vicente Boulevard. 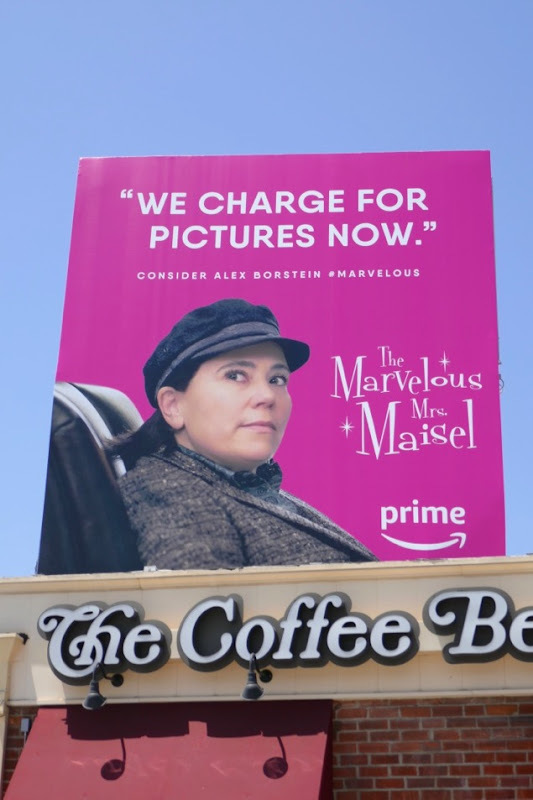 Alex Borstein also gets a chance to shine as Midge's agent in these billboards along Olympic Boulevard and Beverly Glen Boulevard, all snapped on May 29, 2018. 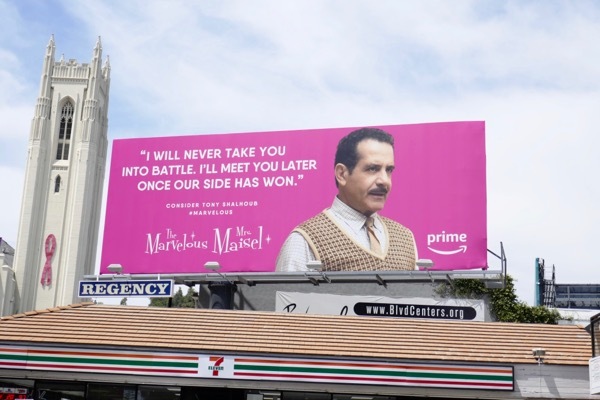 UPDATED: And here's also an Emmy consideration billboard for Tony Shalhoub, who plays Midge's dad, spotted along Highland Avenue on a cloudier June 4, 2018. 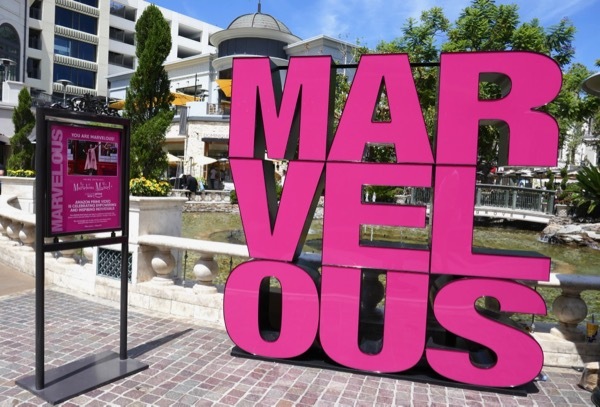 UPDATED: Here's some more out-of-home support for the show's Emmy campaign was spotted at The Grove shopping mall in L.A. on June 15, 2018. 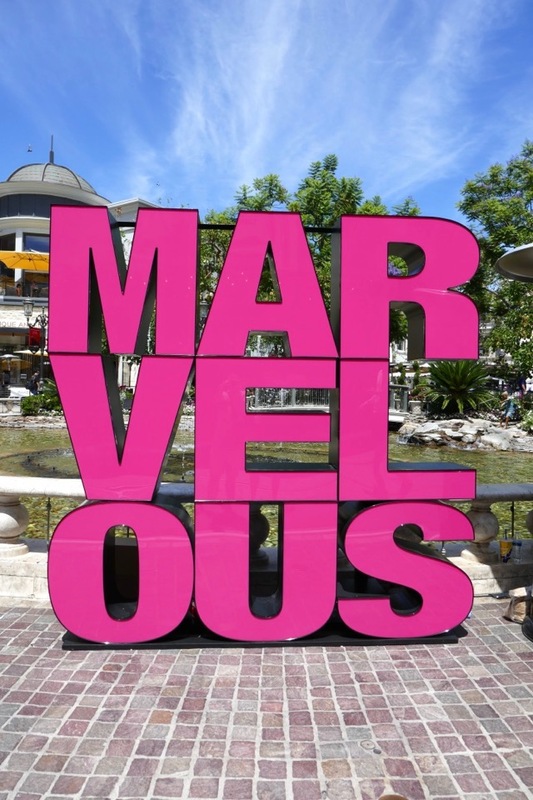 This experiential 'Marvelous' sign is perfect for visibility and social media engagement, encouraging visitors to pose for pictures and post online why they feel inspired, empowered and marvelous. 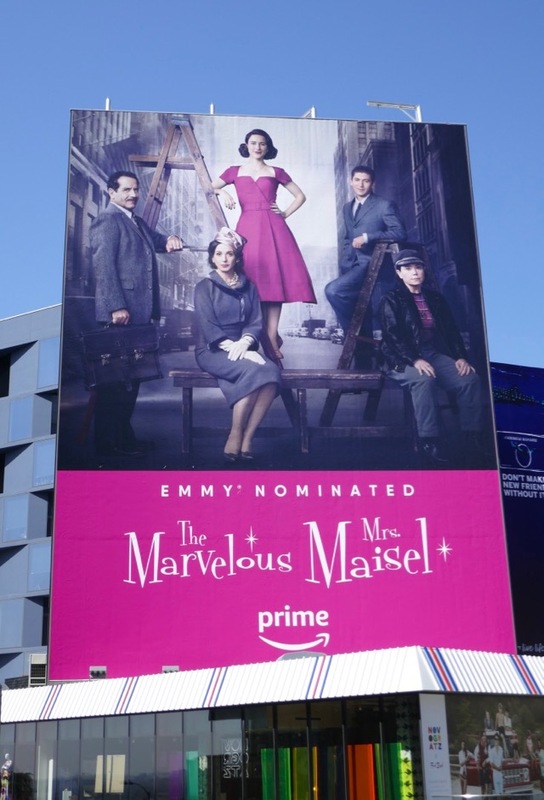 UPDATED: Here's also an ensemble cast Emmy consideration billboard spied at LAX airport on June 22, 2018. 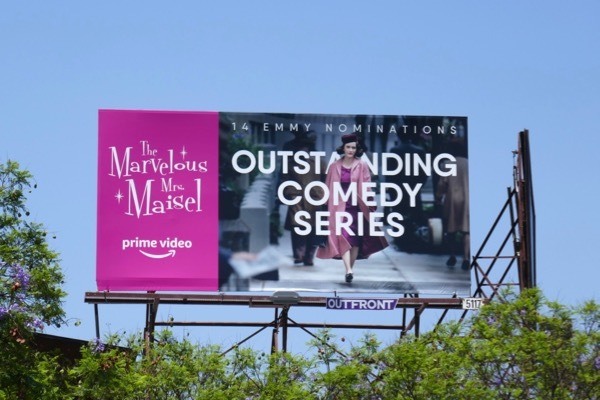 UPDATED: All that Emmy campaigning paid off for The Marvelous Mrs. Maisel as the show and its cast garnered a whopping fourteen nominations, including for Outstanding Lead Actress and Outstanding Comedy series. 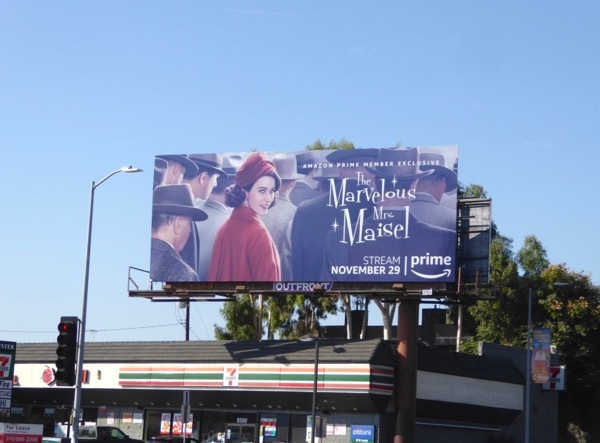 These Emmy-nominated billboards were spotted along the Sunset Strip and La Brea Avenue on July 19, 2018. 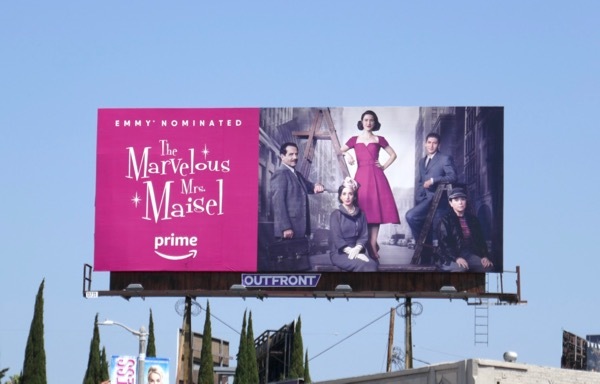 Let's see how many Emmys the series takes home when the winners are announced in September. 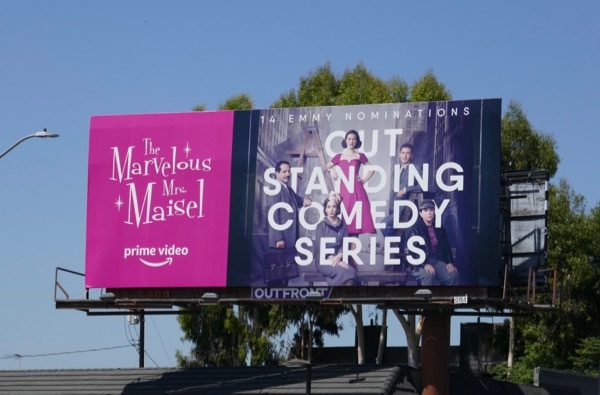 UPDATED: Here's another Emmy billboard for the show up for Outstanding Comedy Series and more, spotted above Santa Monica Boulevard in West Hollywood on July 27, 2018. 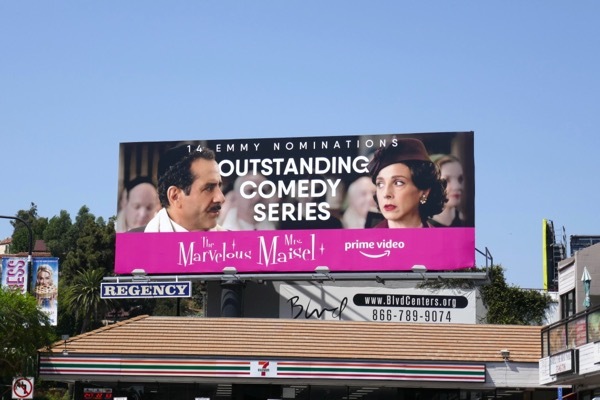 Plus here's another of these smaller Emmy nominee ads spotted above Sunset Boulevard on August 3, 2018. 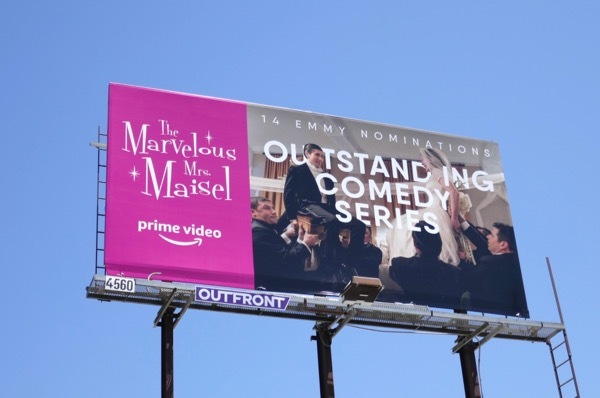 And the Emmy nominee billboards keep on coming for the show with this ad (featuring her cheating husband 'Joel' played by Michael Zegen on their wedding day) spotted above Olympic Boulevard on August 7, 2018. 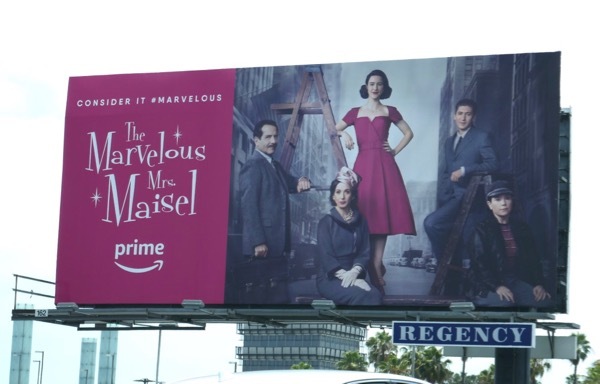 UPDATED: Here's yet another ad creative from the Emmy nominee campaign, featuring Midge's Jewish parents, 'Abe and Rose Weismann' (played by Tony Shalhoub and Marin Hinkle), spotted along Highland Avenue on August 12, 2018.